So, this Year I decided to make Keith Urban the Superstar. Now, I'm not necessarily a fan of Country music and I wouldn't recognize one of his songs if I heard it. There's a story behind my selection for the Superstar of the Year. The other day, I was talking to someone who had already mentioned a dislike for Keith Urban in the past. When this person brought up Keith Urban in conversation that day, they basically said that Urban, as an Australian, has no business singing country music. He then made the comment "Why can't he sing Australian music?" Therefore, I've decided to feature Keith Urban as the Superstar of the Year in honor of walking your own path despite those who would try to bring you down. There are a lot of people out there who get a thrill out of playing the authority on how others should live their lives. You could try to please them. But what you'll find is a lot of different people giving you a lot of conflicting directions on how you should be living. Who do you listen to? If you try to please them, you'll find yourself with no direction. 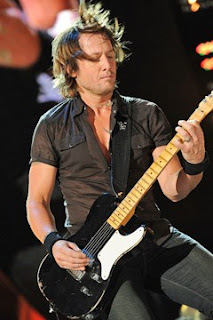 Keith Urban, who happened to be born in Australia instead of the United States, found that he had a passion for country music. He decided to sing country and has made a successful career out of it. He decided to follow his dream despite anybody who would tell him that he couldn't because he was born in the wrong place. So hats off to Keith Urban in honor of everybody who has followed their dream. Also, let this be an inspiration to all who are still trying to find the courage.